it might be from that sort of B-Movie set. It's just the lower level guest room, which isn't used very often, and mostly is the storage room for massive pillow explosions and wayward quilts. I think that I've considered showing this room once or twice, and maybe I have, but usually it falls in the "off limits" category of blogworthy spaces. Today I was cleaning and fluffing getting ready for the kids who will be here next week, and I realized that I didn't think I'd even shared this old white cupboard that was spiffed up a little to hold some of the overflow of my quilt stash. Once upon a time it had had doors and a drawer that actually worked. When I found it the doors had been literally ripped off their hinges and the door frame was splintered. The drawer was just a nailed in front, but I didn't care, 'cause I was going to use it for the quilts...or possibly for my booth space "display". love this set of old wallpapered hatboxes. Do these pillows look familiar? 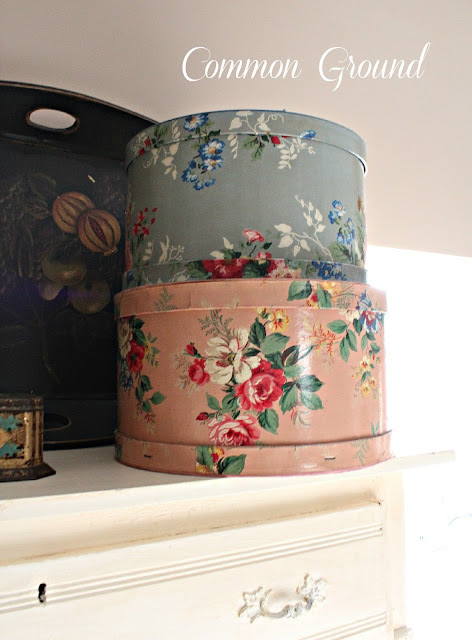 Actually, I found these two just last week that match the other set of this great toile. So, now I have four...yippee!! Old floral still life from the 40's. Well, you've been hiding a treasure cause this room is charming! 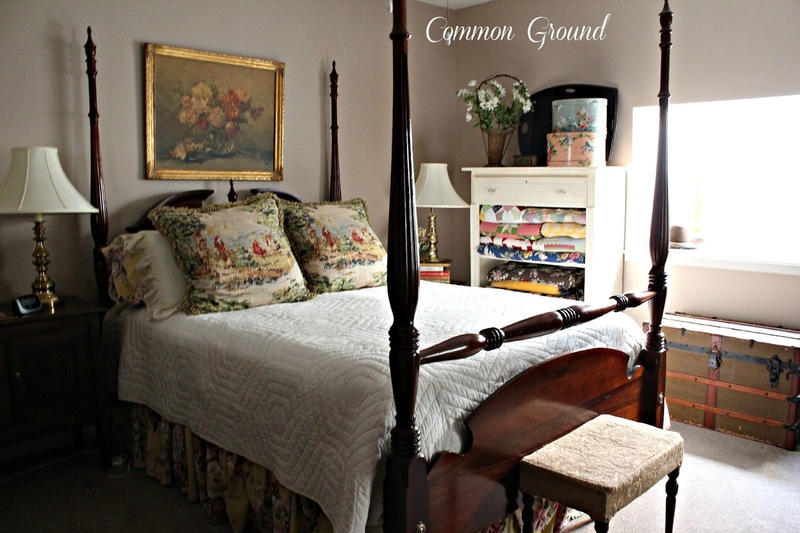 Love the bedding, pillows and your collection of quilts is amazing! Lovely room, I'd love to be your guest! I adore the pillows and the room is too wonderful to not show. Gorgeous! We have the same bed, bought it 28 years ago! I love what you did to repurpose the quilt cupboard! Your unseen place is very lovely! 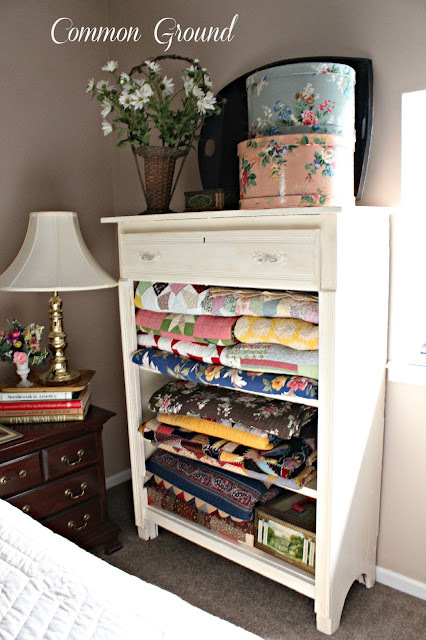 Love those pretty pillows and the quilt cabinet. That was a smart thing to do and use it for. I have that same set of Ralph Lauren bed linens and still use it in my grandma bedroom. I think it's a great guest room, Debra! I'd be very comfortable in it. Love the new toile pillows. What a great size and I love the pattern. I think you've put that old cabinet to good use showcasing some of your quilts. I think it's a lovely guestroom! I really like the new Euro square pillows you found too. That is such a great pattern. I have some "unseen" spaces in my home too, namely my 19 yr old's room and my basement. They're scary! LOL! So...I will arrive this weekend...ha! I think the accomodations will be more than adequate!!! Your guests are very special! oh my that room is beautiful.. It's lovely Debra. I love the white quilt cabinet and the hat boxes. I'm pretty sure my daughter's room will remain unseen! 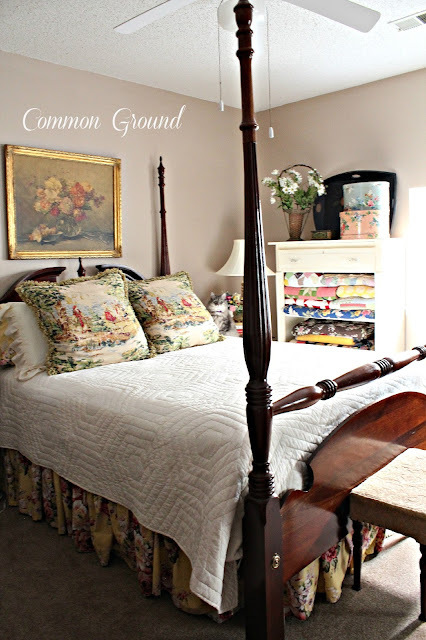 Love this "Unseen" guest room, dear friend!!! I totally, understand the "massive pillow explosion" statement. Our Guest Room held the deck cushions off~and~on this Spring as we weathered the Spring Showers and storms. One day, I told "Mr. Ed"...the pillows STAY on the deck. . .even if they're "Gone With the Wind"!!! Thanks for sharing your lower level Guest Room, dear friend!!! Debra everything is just beautiful. I am in love with the picture above the bed! This is just a "hidden treasure" of a room, Debra! SO charming! 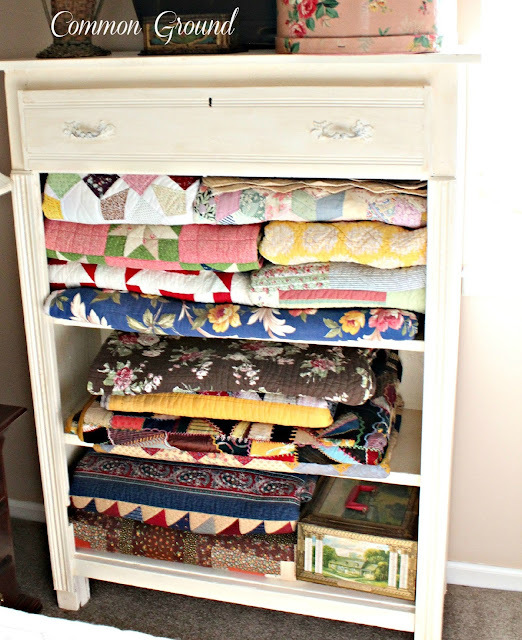 You have a wonderful collection of quilts and the old cabinet is a brilliant way of displaying them. I just really love this pretty room! I wanted to thank you for your kind comment on my last post but I couldn't find your email address. I'm not understanding Google+ very well. So, Thank you! I love the room! What a great idea for displaying/storing quilts. So neat that you were able to salvage the cabinet for a new use. Mine hang on a quilt "ladder" right now, and I'd much prefer to have them in a cabinet! I might have to keep my eyes open for just such a piece. That is a very inviting room, Debra. What a great stash of quilts, too - wow! 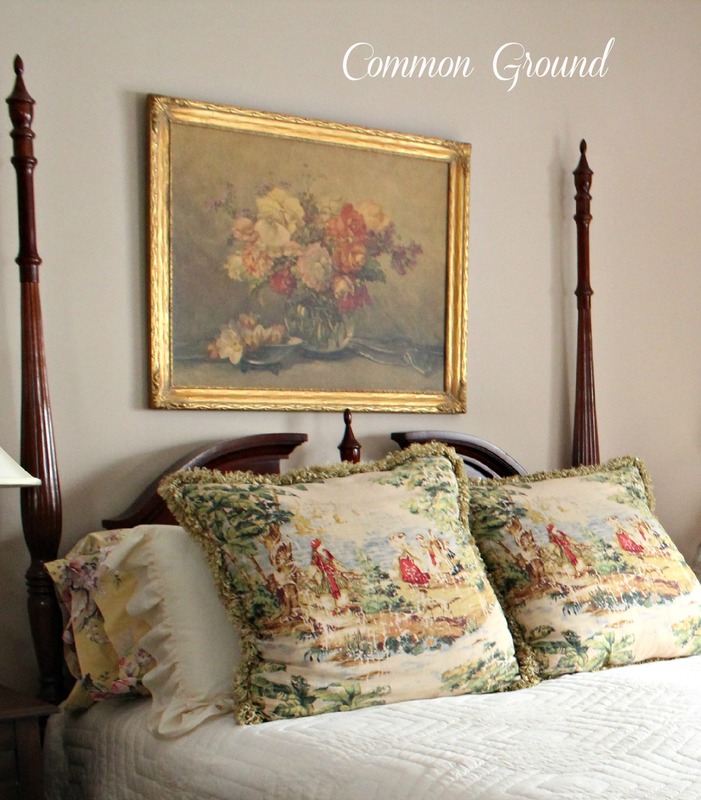 GREAT finds on those awesome toile pillows, love that pattern! I love your pretty guest room. It reminds me of a home in England with all of the quilts and floral, toile patterns. The painting is so pretty. Such a fabulous room! Love the dust ruffle and pillows, and how they look with the quilt! That picture above the bed is gorgeous. Lovely room. It is a lovely room, Debra. I love the bedding and the stacks of quilts and just simply all of it. There are one or two of these hidden rooms in our home, too. oh my, if only my "unspeakable" spaces looked this good! i love that lauren fabric, too. some things are timeless - toile being one in my opinion! Love your guest room!...and the chest is the perfect piece to display your beautiful quilts...and I had the same RL pattern years ago...just recently donated the comforter set....but kept the sheets as I just love the pattern...beautiful room and have fun with your family. I think your guest room is very worthy of posting space. It is beautiful. You've been hiding this beautiful room because you know I'd be HAPPY to stay there, probably outstaying my welcome! LOL! It is lovely Deb! Your guest room is charming. I love the dresser and quilts. So adorable. The room looks so inviting. I think this room is just lovely. that old dresser with the quilts is such a cozy aspect to the room! are so beautiful! Love what you did to the dresser! I have the same Ralph Lauren pattern too in a comforter set....I just can't bring myself to part with it! From the comments, it was very popular. The room is so pretty and very inviting. The pillows are very nice and love what you did with the quilt cabinet was so smart. We all have those hidden rooms, but mine is not nearly as nice as yours. 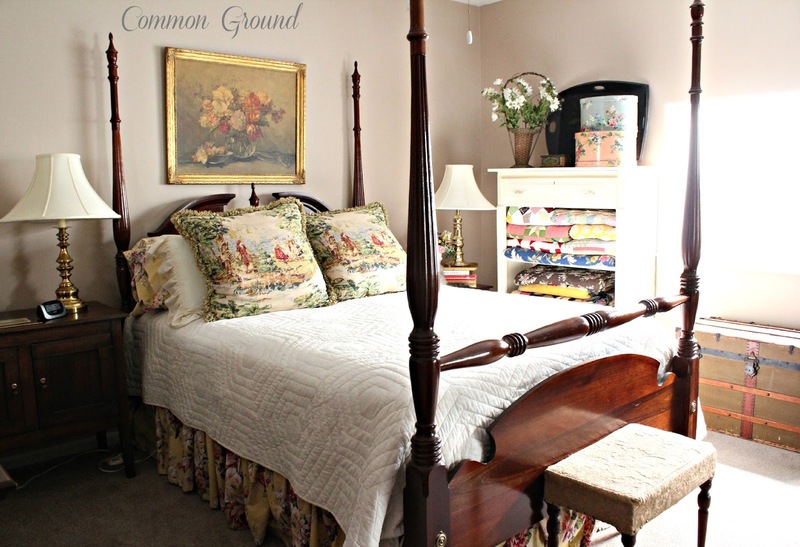 A very charming guest room! 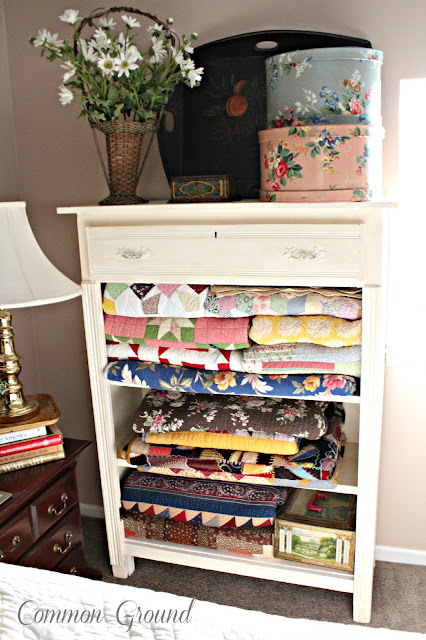 I'm loving the quilts in your repurposed dresser! And the still life, and the hat boxes, and the funeral basket too. Such a nice spacious guest room! I can't wait to see the rest of your unseen spaces. I love this room. The cabinet is darling and wonderful for quilt display. Such a beautiful "hidden" place. Thanks for sharing it with us. Not only was this room 'unseen,' the repurposed updated white chest was unseen until you saw its potential. What a creative remake of the chest. The toile pillows are indeed beautiful, and I can see why you love them. I do too, and they would not go with anything in my house! With a guest room like that, you should invite folks every weekend! 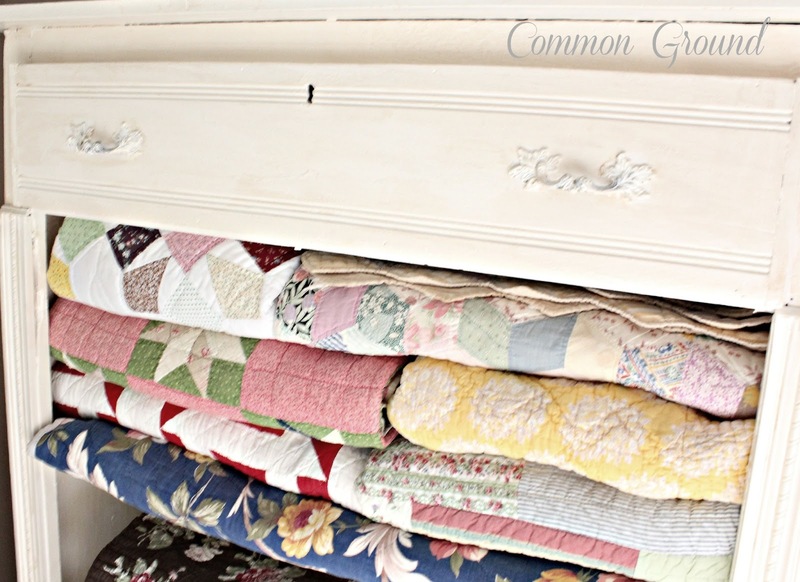 There's nothing prettier in a room than old quilts. What a beautiful way to enjoy them! I like all my horror movies to feature toile and 1940's pictures. The quilts all stacked in that chest make my heart flutter but in a good good way. Pinning it from Debbiedoos pinning party! So so pretty!!! No need to hide this beauty Debra. The room looks so comfy cozy! Love the quilts displayed in the fun cabinet. The hat boxes are wonderful too! Thanks for sharing with SYC. Oh Debra... plump cushions, folded quilts and vintage hat boxes... I'm in 'shabbilicious' heaven. You really must show this room more often. 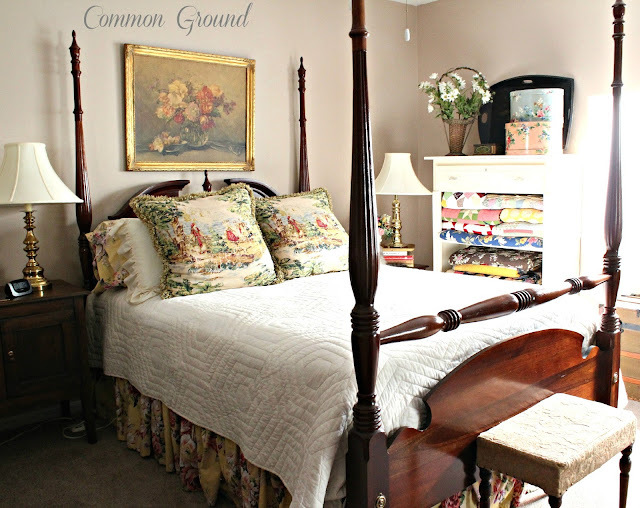 I'll be featuring this gorgeous room at this weeks Shabbilicious Friday link party. I love this room too. There is nothing more cozy than quilts being displayed like that. Great look!